Shush Be Tou Lake Campground was created by impounding the waters of Bog Creek to the west. Camping is reletively spread out allowing for trailers and privacy. The campground has water but you will need to get it back by the Highway and bring it to camp. If you fish the the lake, you can catch rainbow, brook and brown trout. Shush Be Zazhe Lake Campground has 6 campsites and is located just east of Shush Be Tou. Amenities are basically the same. I have never seen a more elaborate campground in all of my life Almost every campground was decorated, lending me to believe that there are many summer long campers here. Also, the fire pits of rock are on steroids here, some are taller than the picnic tables. You have to see it for yourself. Shush be Zahze is definitely the nicer of the two campgrounds. 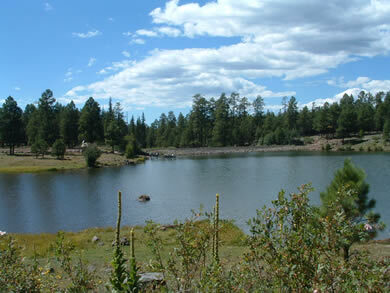 From Pinetop take U.S. Highway 260 east for 15 miles to the small road sign leading to the campground. Note: if you pass the Hawley Lake turnoff, you have gone about 1000 feet too far. Both lakes are accessible from this road.